A shopping list of obvious suggestions for improvement can't detract from the fine results delivered by this superb slicer. Easy to use. Great results. Versatile effects. Unconventional modulation. Great presets. No dry/wet mix. Needs better colour-coding. 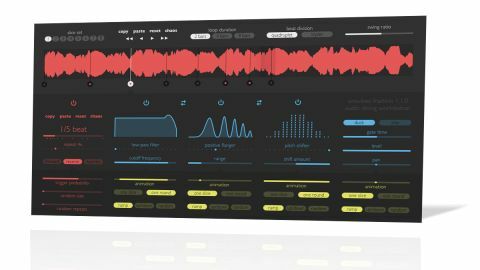 Sinevibes' take on the ever-popular loop-slicing and repeating effect, Fraction (AU) is remarkably easy to use. It operates over a 2-, 4- or 8-bar loop with the incoming audio displayed as a waveform divided into eight slices, each of which is then processed independently. The placement of each slice start point defaults to being evenly spaced on a quadruplet or triplet basis, but they can be shifted manually along the waveform and even cross over. They can't, however, sit directly on top of each other. Swing can also be progressively applied to their placement, and slices can be switched on or off. Up to eight sets of slice points can be saved and hot-swapped - handy for live performance - and there are Copy, Paste, Reset and Chaos (randomise) buttons for each set, plus buttons for shifting the start point of the loop. Each audio slice can have up to four processes applied: one Repeater and three optional effects chosen from a collection of 15, including filters, modulation processors and other staples. Each effect can be individually activated, and settings can be swapped between adjacent modules, for fast reordering of the signal flow. Programming could be made clearer, however, if slices and their corresponding effects were colour-coded. The Repeater section is central to everything, allowing up to 16 repeats of a slice. Slice length and timing can be adjusted to anything from 1/16 to one beat, taking in interesting settings like 2/3 for swung and syncopated repeats. Slices can also be reversed or played in forwards-then-backwards mode, and you can set the probability of a slice being repeated, and randomise its length and/or repeat number. The whole setup is bursting with loop reordering and randomising potential, but it's those effects that really make things exciting. The output section for each slice offers two modes: Duck mutes the input while processed slices play, and Mix blends the slices with the input signal. Gate time sets the length of the slice playback 'window' (from 10-100%), while playback level ranges from mute to +6dB (the extra gain is useful for countering signal- attenuating effects), and pan can be applied. Finally, there are controls for the modulation envelopes triggered by the slice repeater. There are a few obvious omissions that we think would enhance Fraction, such as global wet/dry mix and smoothing controls (per slice and/or global) for the ducking mode to alleviate the clicking that sometimes occurs. An amplitude envelope for individual slices would also make a nice adjunct to the gate, while a master reverb would be very welcome, as Fraction works really well on an auxiliary bus, where reverb adds size and space to the repeats. We'd like some global modulators, for taking control of multiple slices/ effects collectively. Fraction is an excellent effects plugin, yielding hours of creative fun. It goes far beyond simple loop repeating and reordering, enabling pseudo delays, exciting glitch edits and more. Whether applied to harmonic or rhythmic material, there's something on offer here for electronic and pop producers of all kinds, despite our feature wishlist.